It has being more than two years since my last Eggless Dark Chocolate Ice Cream post till now. And recently I was motivated by some of my Instagram friends homemade ice cream posts which I decide to make this super easy "No-Churn Coffee Ice Cream" from Nigella Lawson site which you can easily whipped it up at home in less than 10 minutes. In her website there are a few no-churn ice cream recipes and I have selected our favourite Coffee Ice Cream that used espresso powder and Kahlúa liqueur (instead of espresso liqueur mentioned in the original recipe) which satisfy the craving of coffee lovers like us. I love this recipe mainly because it is eggless plus you don't even need an ice cream maker. 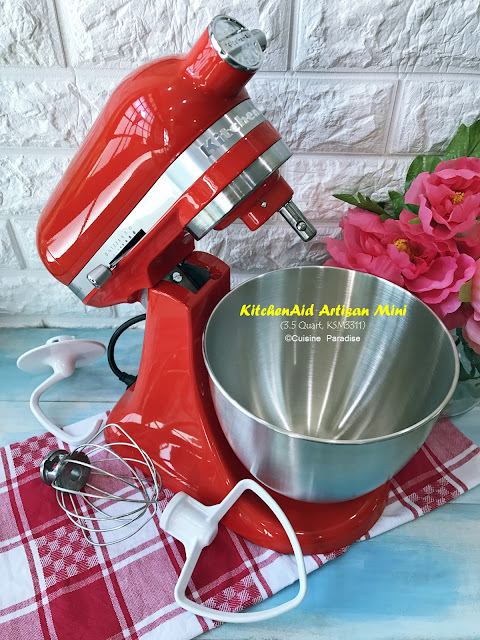 What you need to do is whisk up everything in a mixing bowl using electric beater and freeze it in air tight container. For my case, I used my Bosch ErgoMixx Hand Blender where I pour all the ingredients into the tall beaker and blend it till smooth. In terms of the word "pudding" it can be used to describe both sweet and savory dishes like "cheese pudding", "bread and butter pudding", "Christmas pudding" and etc. For this post, I will be sharing a a low fat pudding using plain yogurt to replace the usual cream or egg found in most pudding recipes. And it can be easily whip up in less than 10 minutes, after which pop them into the fridge and serve it with your desire toppings. In order to make it an Asian flavour I added some pandan paste to achieve a lovely green and aroma for this dessert. And for those staying overseas like United States, Australia, Japan, Europe and etc where you cannot easily access to fresh Pandan Leaves, I will suggest you can stock up a bottle or two of the Pandan Paste from your local Asian grocery stores. As these lovely paste do comes in handy when you want to make some Asian delights such as Pandan Chiffon Cake, Pandan Waffle, Nasi Lemak Rice and etc. A few days back during our trip to Chinatown, I saw a stall selling Osmanthus Chestnut Cake (桂花马蹄糕) at a price of S$8.50 per box which gave me a shock. The price that they are selling per box is more than enough to replicate 3 similar boxes if you know how to make it at home. Although my recipe here might not be as authentic when compared to those sold outside in the shop but at least this is not a difficult dessert which you could do it at home for your guests or as a New Year gifts. There are so many festive bakes to make during Christmas season like Gingerbread Man, Classic Chocolate Brownie, Yule Chocolate Log and etc. Here is another quick festive dessert follow by the Pancakemisu which I have shared two weeks back. 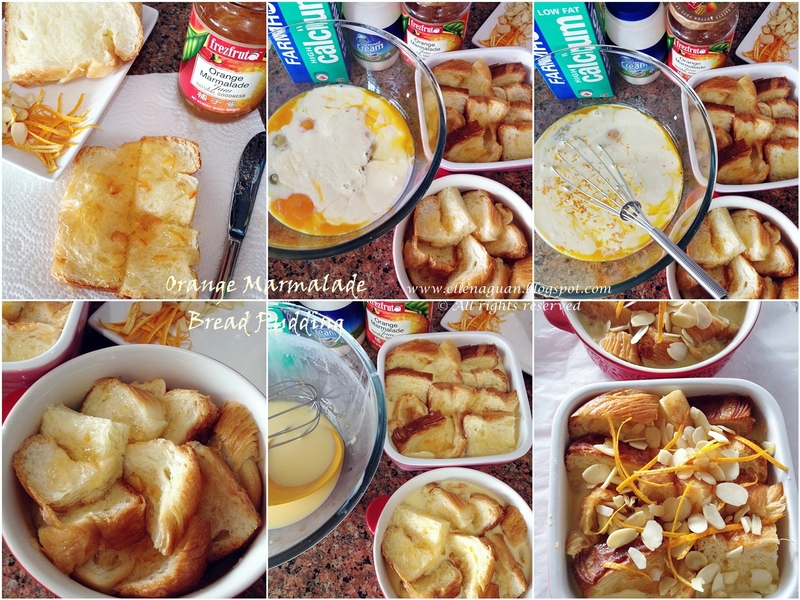 I am sure most of you have tried Bread and Butter Pudding which is one of those classic English recipes that everyone loves. With the addition of marmalade with the egg custard, it gives the bread pudding a zingy orangey taste which makes the whole thing superb. This dessert is so yummy with layers of soft custard insides that contrasts with the crispiness of the buttery danish bread and nutty almond flakes on top. And it is also very easy to prepare just by whisking together the custard ingredients, pour it over on the bread, bake till custard is set and top is golden brown in colour. 1. Preheat oven to 180°C (degree Celsius). Lightly grease the base of two 12 x 12 x 8cm square baking dish and set aside. 2. Spread each pieces of Danish bread with Frezfruta Orange Marmalade, cut it into 8 small pieces and layer them into the two prepared baking dish. 3. In a large bowl, whisk together egg, milk, cream and orange zest for 1 minute till smooth. Carefully pour the egg mixture over the bread and leave it to soak for 5 minutes. 4. Cover baking dish with foil and bake for 20 minutes, remove the foil and continue to bake for another 5 minutes or until top is golden and the custard is set. 5. Remove the pudding from oven and allow to cool for 5 minutes. Dust with icing sugar and serve immediately with a cup of Gold Kili Instant Double White Milk Tea. ~ For extra flavour, you could sprinkler some castor sugar and julienned orange zest on the bread before baking..
During baking the bread pudding will puff quite a lot which resemble soufflé but it will deflate once it is out of the oven so remember to use a deep baking dish instead of shallow one for this recipe. And with this easy recipe you could prepare a quick festive dessert to impress your guests together with some Floral or Milk Tea which is perfect beverage to go with bread pudding. Black Sesame Paste is one of the common dessert found in dessert chain outlets such as Ah Chew Desserts, Dessert Hut, Er Gu Dessert (二姑糖水) and etc. And some believe that by consuming black sesame paste it also helps to nourish the blood, lubricate the intestines and clear "wind" in the stomach too. On the down side, for those suffer from spleen troubles, diarrhoea or loose stools should avoid over-consumption of these small seeds. 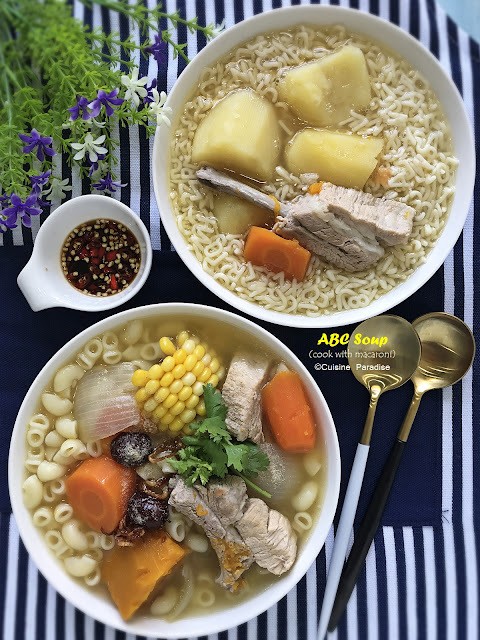 After the previous recipes on Broccoli And Spinach Soup, Pumpkin And Meat Porridge; this post I would be sharing another quick Asian dessert which I am sure most of you would love it. The consistency of this Black Sesame Paste could be adjust with additional 100 - 150ml more of water during cooking if you prefer a more dilute and watery paste. 1. Pre-soaked the rice for at least 30 minutes, drain well and set aside. 2. Rinse the black sesame seeds, drain well and pan-fry till completely dry and fragrant. 3. Place sesame seeds and rice into Cuisinart Hot And Cold Blender glass jug together with water. Set the timer to 20 minutes, blend the mixture for 30 seconds using SPEED 1. 4. Next add in pandan leave and sugar, bring the mixture to boil on HIGH for 5 minutes before switching it to SIMMER and continue to cook until end of the cycle. 5. 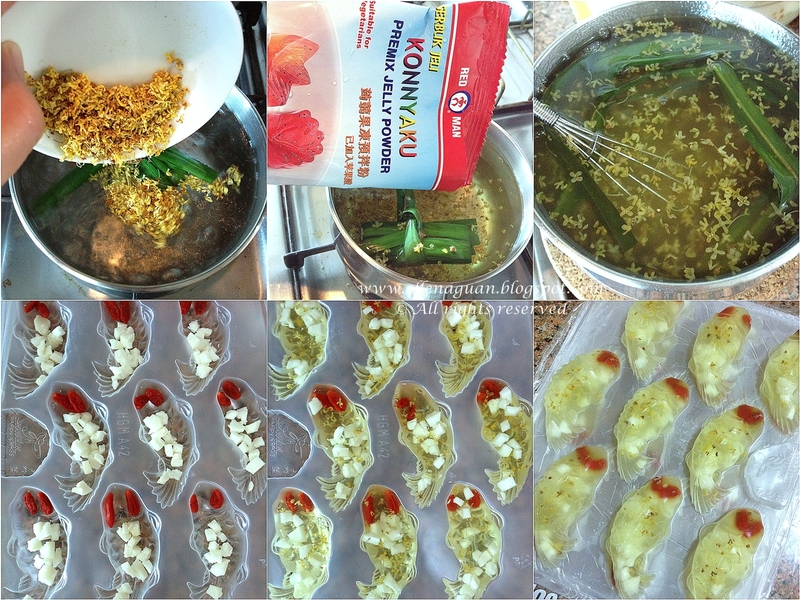 When everything is cooked, remove the "pandan leave" and PULSE the mixture twice or more to achieve your desire texture. 6. Ladle Black Sesame Paste between serving bowls, garnish with roasted almonds and serve immediately. To serve you could top it with some roasted almond to enhance the taste or even with a scoop of Vanilla Ice-cream if you are open to some adventure new combination. Till then I would update more recipes such as "Watermelon Granita", "Porridge", "Bolognese Sauce" using Cuisinart Hot And Cold Blender soon. 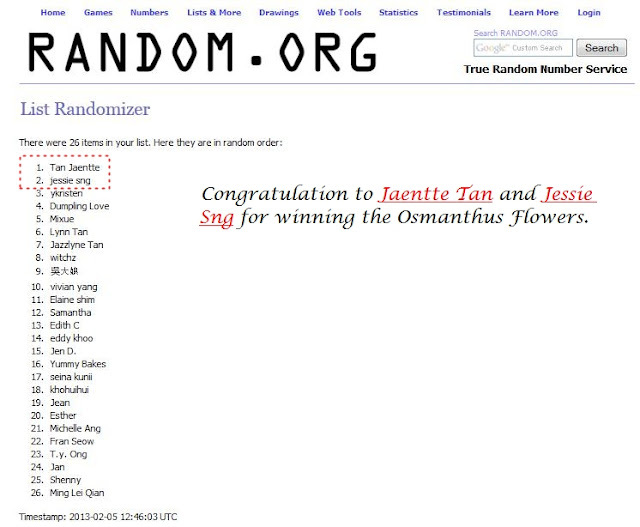 Just for your information, I saw from ToTT's Facebook page that they already round-up the 8 Finalists for Cuisinart Soup Making Competition (Singapore region) which will take place on 01 December 2012. After which the winning team will represent Singapore in the regional competition in Hong Kong for the championship! So why not "VOTE" and support your favourite soup shown above at ToTT Facbook Page (link here) and be one of the 4 Lucky Voters to win a set of Cuisinart Silicone Ware worth S$80.00! 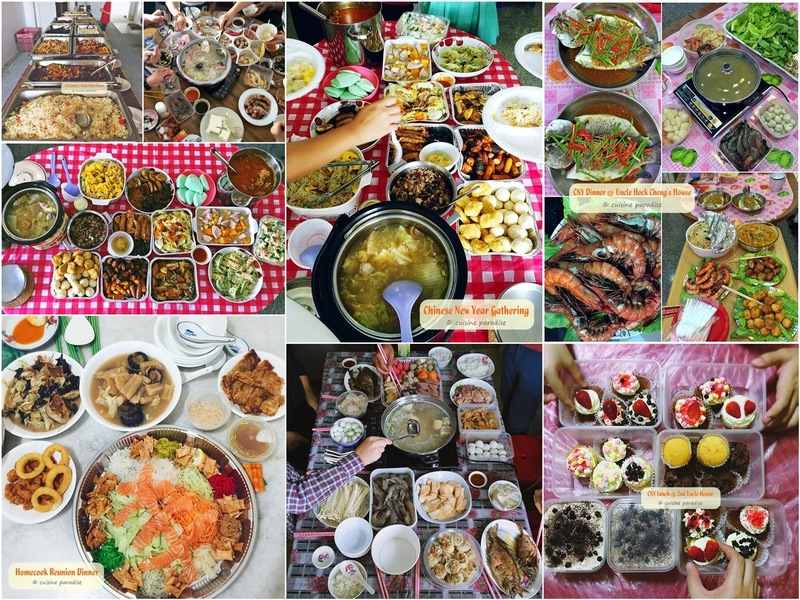 I have "voted" the Healthy Prawn Broccoli Soup (2nd row, 2nd soup), what about you? When you do a goggle search on "lemongrass jelly recipe" you will see a long list of choice to pick and experience on. Through the list, my favourite pick comes from Shirley's site at @Køkken (recipe), she shares a very easy recipe using "gelatine powder" instead of the Konnyaku Premix that I used which is not common in some countries. So for those who cannot get hold of the premix like what I used, perhaps you would like to try using Shirley's recipe if you are interested to make some. Here I have simplify the steps and ingredients by using Konnyaku Premix Jelly Powder to make this refreshing jelly and you can add in some fruits such as kiwifruits, aloe vera, mini grapes and etc to enhance the flavour. 1. Bring 1.5 litres of water to boil, add in lemongrass and pandan leaves, simmer the mixture for about 15 minutes on low heat. 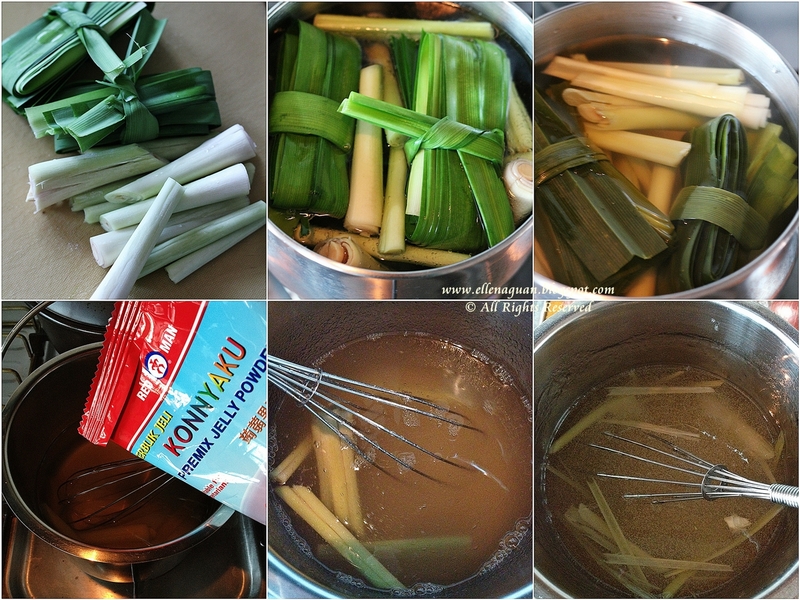 2.When done, switch off the heat, measure 1250ml of the lemongrass water (you can leave a few stalks of the lemongrass in it) and set aside to cool to room temperature. 3. Next stir in Konnyaku premix jelly powder into the cool lemongrass water, bring it to boil again on medium heat. 4. Remove from heat, stir till bubbles dissipate. 5. Half filled the jelly mould, topped with some chopped kiwifruits and filled it to the rim of the mould. 6. Cool to room temperature and keep refrigerate. Personally I love the taste and fragrant of this lemongrass jelly because of it's light and refreshing taste. 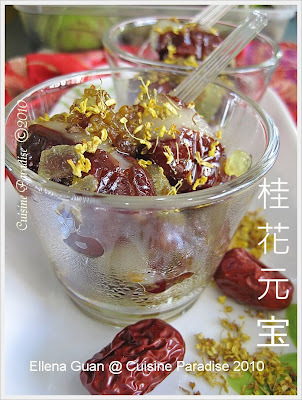 And for more creative way of making your jelly, you can add in canned fruits such as longan, fruit cocktails and served with ice cubes, or just served it as in it with more fresh cut fruits or etc. I am sure this will make a great party dessert too! Time flies, tomorrow is the last day of the "Zespri® 14 days Daily Scoop of Amazing Challenge (#14daysofZespri)" and to mark off the finale of this challenge I would be sharing my last experiment using Zespri® Kiwifruit to bake a "Kiwifruit Chiffon Cake". For a challenge I have used fresh Kiwifruit Puree instead of the usual kiwifruit jam recipe shown online. So if you are interested, stay tune for the recipe tomorrow! I am sure those of you who has being following my threads on the various social media platforms (such as facebook, twitter and instagram) would have been seeing me updating a lot of "kiwifruits" related posts for the past one week. (so sorry if I have "spam" some of your timelines :p ) As you have read from my previous post(s), this year I am taking up the "Zespri® 14 days Daily Scoop of Amazing Challenge (#14daysofZespri)" to test out how creative I can work with these "fuzzy brown fruits" to incorporate them into our daily diet. So over the past weekend, I have come out with a 4 Course Kiwi-licious Menu starting with:- Apple, Kiwifruit And Mint Smoothie, Baked Drumlets With Kiwifruit And Mint, Spicy Penne With Salmon And Kiwifruit follow by a refreshing Lemongrass Kiwifruits Konnyaku Jelly for dessert. 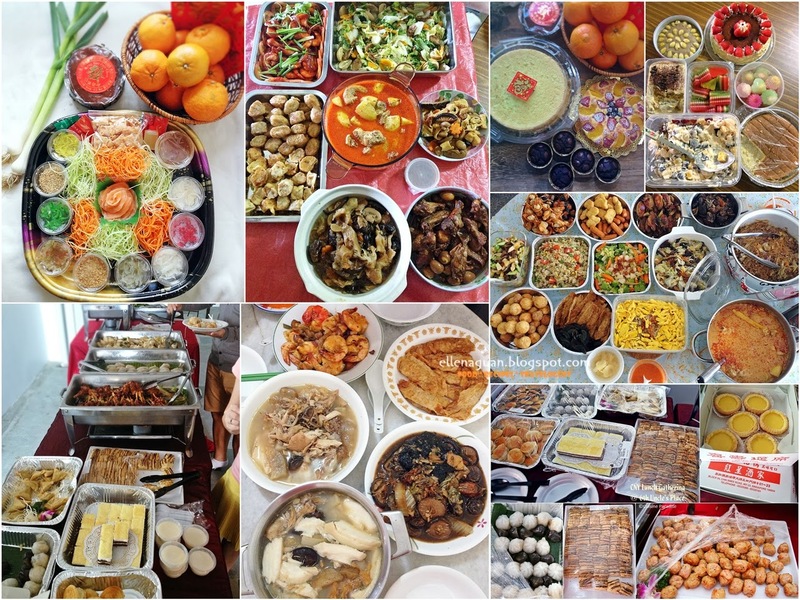 In this post, I would be sharing the first 3 recipes whereas for the Lemongrass Jelly it would be featured in another post. Today is 7th day of my "Zespri® 14 days Daily Scoop of Amazing Challenge (#14daysofZespri)" and it feels really wonderful and amazing on how these "brown fuzzy fruits" could actually benefit our health and improve our daily intake of Vitamin C and etc. And as you probably will know Yoghurt is nutritionally rich in protein, calcium and etc so by making a dessert using yoghurt and kiwifruit is definitely a awesome choice as it has all the goodness in a cup. So rather than using "cream cheese" plus yoghurt to make the parfait, I have omitted the cream cheese and used only yoghurt and kiwifruit for a lighter and healthier dessert. 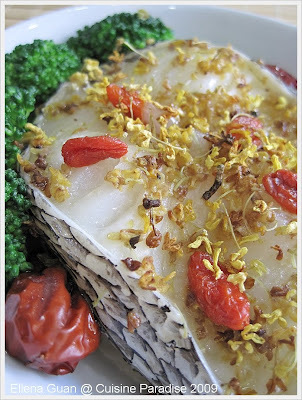 This quick and simple recipe can also be prepared a few hours ahead and served after meal. And you don't have any "kiwifruit jam" (recipe HERE) you can replaced it with some honey or store bought blueberry jam which taste equally good too. 1. Place the digestive biscuits in a ziplock bag and crashed it coarsely with a rolling pin or glass bottle. 2. Peeled the skin of the kiwifruit and sliced it to about 0.5cm thick (6 - 8 slices). 3.To assemble the yoghurt parfait, place some crushed digestive biscuits on the bottom of the serving cups. 4. 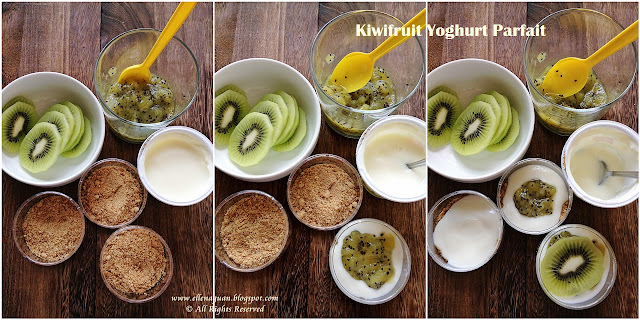 Spoon in 1 tablespoon of yoghurt, top with a slice of kiwiwfruit, another spoonful of youghurt follow by a teaspoon of kiwifruit jam on it. 5. 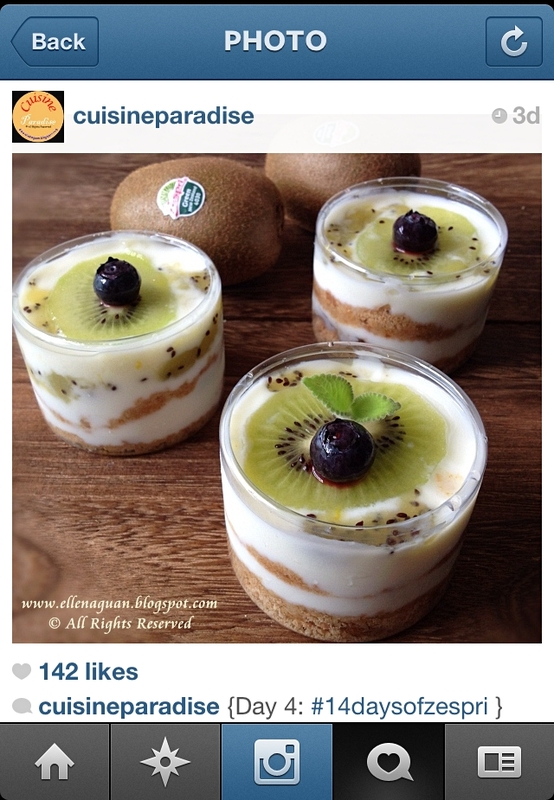 Lastly top with some youghurt and another slices of kiwifruit on top as garnish and serve. After sharing this quick and healthy dessert over the Social media platform such as Instargam and Facebook, it did received quiet a number of "Likes" and "Comments" too. 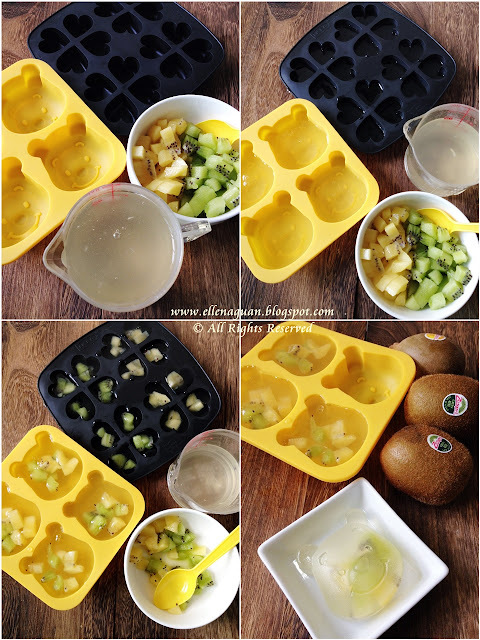 Other than using Kiwifruits to make the "Yoghurt Parfait" shown above, you can also cut it into cubes and mix with some canned fruits such as Longan, Lychee or Fruit cocktails and served it as a refreshing after meal dessert. 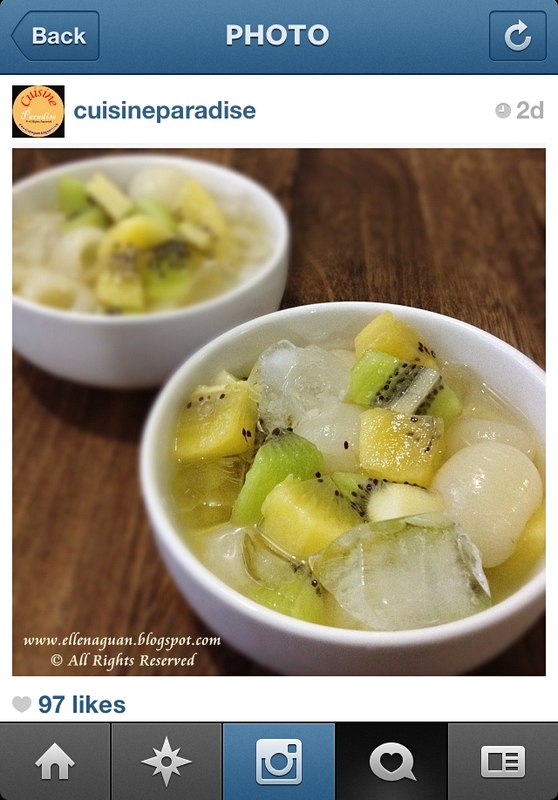 My this version was inspired by Keropokman's "Longan Dessert", I added some mixture of cubed Zesperi® Gold/Green Kiwifruit which gives it twist to contrast the sweet and sour flavour kiwifruits and Longan in syrup (Instagram photo HERE).